Millions of Americans suffer from neck pain every year. Neck pain can come in many different forms: a kink in the neck, whiplash injury, stiffness, popping or cracking when you turn your head. Sometimes the pain starts in the neck but moves up the back of the head. If you have experienced any of these symptoms you can relate! 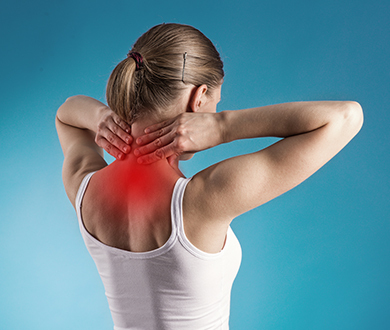 For many, neck pain is very irritating and affects the quality of life. You can experience problems with concentration, sleep issues, difficulty playing sports, reading or basic household chores. There are many causes of neck pain. Some of the common ones we have seen in our years of practice include forward head posture, abnormal spinal curves, spinal misalignment, trauma, flexibility problems, and herniated discs. Forward Head Posture: One of the most common causes of neck pain is the Forward Head Posture (FHP). This problem is caused when the head is too far in front of the shoulders or the rest of the body. It has been estimated that as much as 98% of people have some form of FHP. This problem has worsened since the increased use computers and smart phones. Those who spend hours a day, many days a week in front of a computer tends to lean forward while working. Day after day, this position causes the neck to misalign. Abnormal Spinal Curves: Viewing the spine from the side reveals an “S” shape curve. The neck (cervical spine) should have a forward curve of 42 degrees, based on research. This curve provides a shock absorption, flexibility and protection for the joints and discs. Losing the neck curve sets up a premature wear and tear of the joints. Proper analysis of spinal curves requires precise x-rays. Doctors of Chiropractic trained in advanced biomechanics perform complex geometrical analysis of the spine with precise measurements to determine the severity of the curves. Spinal Misalignment: Your spinal bones can become misaligned as a group (globally) or as an individual segment (segmentally). Even one spinal bone misaligned is enough to cause nerve irritation and pain. Unfortunately, medication will not realign vertebra, only a Doctor of Chiropractic is qualified to gently realign the spinal bones, taking pressure off of the irritated nerves. Trauma: A major cause of neck pain is various types of trauma. Auto accidents, slips and falls, sports injury and even the birth process can cause damage to the neck and its structures. Traumatized bones, joints, discs, ligaments and muscles produce inflammation and result in pain. If you have suffered trauma of any type to your neck, get evaluated by a Doctor of Chiropractic. Flexibility Problems: It is quite common to find chronic neck pain caused by a lack of flexibility. Lifestyle habits such as a being sedentary, too much time in front of a computer or even old untreated injuries can result in tight, inflexible muscles and ligaments that are prone to re-injury. Stretching the neck muscles to restore normal motion can bring great results, yet not all stretching programs are safe! It is wise to consult a Doctor of Chiropractic to ensure that your stretches are safe and effective. Even better, have them design a custom program for your health needs. Herniated Disc: Disc herniations, while quite painful, do not necessarily require surgery. Only the most severe cases that have not responded to chiropractic care or physical therapy should consider surgery. Most surgeons will require multiple rounds of physical therapy before they consider surgery. The chiropractic approach to treating disc herniations it to restore the normal curve in the neck, reducing the accompanying muscles spasms and pain. It is typical for most people to treat their neck pain with over the counter medications such as Tylenol, Aleve or Motrin. Sometimes they provide temporary relief. Unfortunately, the problem usually returns. At this point, many will call their primary healthcare provider for their help. The typical treatment prescribed is stronger medication such as a narcotic pain reliever and muscle relaxers. Again, many times this approach fails because medications only attempt to mask the pain: they don’t fix the cause. An analogy would be cutting the wires to a fire alarm that is going off: you wouldn’t hear the alarm any longer, so you think all is well! Yet the building is burning down around you! While medications have a place in health care, using them for musculoskeletal problems (back and neck pain, headaches, etc.) are usually ineffective and only mask the pain. Instead of covering up your pain with pills, a better choice is chiropractic care with rehabilitation. Not all chiropractors do the same thing: it’s important to pick the one that has the training to treat neck problems. When should I get treatment for Neck Pain?